What lingers from what you see at the theatre? Alarmingly random things, in my case. And, as I grow older, alarmingly distant things. Chatting with a friend yesterday evening, it turned out we’d both seen the same RSC production of King Lear as teenagers and between us could name most of the cast. We could probably do you the storm scene at a push. What I saw last week? Not so clear. In fact, my latest review assignment was so tepid that I’d be surprised if I can recall it in a year’s time. If anything remains, it will probably be my involuntary cringe at the comedy curtain call. But sometimes, all you need to hold onto is a single incendiary image, a jolt of remembrance that will ignite your engagement with an entire work. 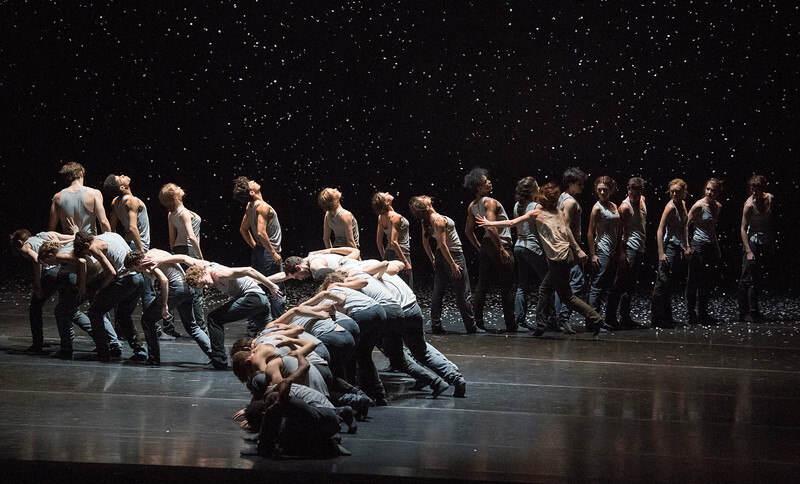 Last month, I saw Flight Pattern, Crystal Pite’s long overdue Royal Ballet debut. A large-cast work plugging into the contemporary migrant crisis, it’s as good as everyone said, and I remember its scale, its emotion and its visual audacity. But the detail that jabs at me – one that I suspect will remain when all else falls away – is a trope that Pite repeats from the beginning, as her dancers snake across the stage (Alastair Muir captures it beautifully in the photo above). They often stand in lines, queuing, inching ahead, following uncertain paths, waiting for the next move. And as they do, they’ll often lean backwards, then trudge forwards. Back arched, head down. An expansive curve and a self-protective huddle. Arc and clench. Why did this tiny juxtaposition stick? Because it exemplifies the pull between artifice and actuality that makes Flight Pattern so powerful. That backwards arch is all yearning expression, all hope, all craving for flight. You won’t see it on the news, though perhaps you’ll feel it. The forward trudge – that you’ll see. Keeping one foot in front of the other, keeping your head down, holding it together as best you can. It’s a posture that is unhappily familiar. Back arched, head down. Arc and clench. Curve and huddle. I think it’s here to stay.